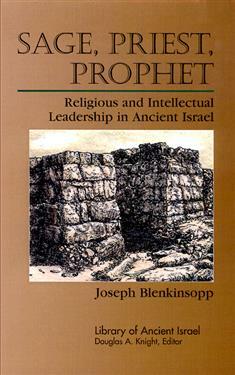 In this first volume of the Library of Ancient Israel series, Joseph Blenkinsopp investigates three forms of biblical Israel's intellectual and religious leadership: the sage, the priest, and the prophet. The people who occupied these roles were directly responsible for what appears in the Old Testament text. Blenkinsopp looks at the development of these roles and how they functioned in their particular time and place. This investigation will lead to a keener understanding of the literature of the Old Testament and the society in which it evolved. Volumes in the Library of Ancient Israel draw on multiple disciplines--such as archaeology, anthropology, sociology, linguistics, and literary criticism--to illuminate the everyday realities and social subtleties these ancient cultures experienced. This series employs sophisticated methods resulting in original contributions that depict the reality of the people behind the Hebrew Bible and interprets these insights for a wide variety of readers.